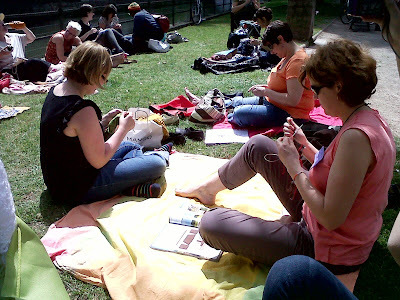 Worldwide Knit in Public day was on Saturday, and I was delighted to find out that there was a public knitting group organised in Strasbourg. I'm a bit shy about going to these things on my own, so when a friend asked if I wanted to meet up on Saturday I suggested we go to the park where the knitting was happening. She then said she had learned a few stitches over Christmas and had already knit a garter stitch scarf, but gave up soon after that. So I brought her a pair of needles and she got to work! Because I'm shy, we decided to sit on a bench at first and watch the group to suss out if they all knew each other or if they were welcoming newbies as well. 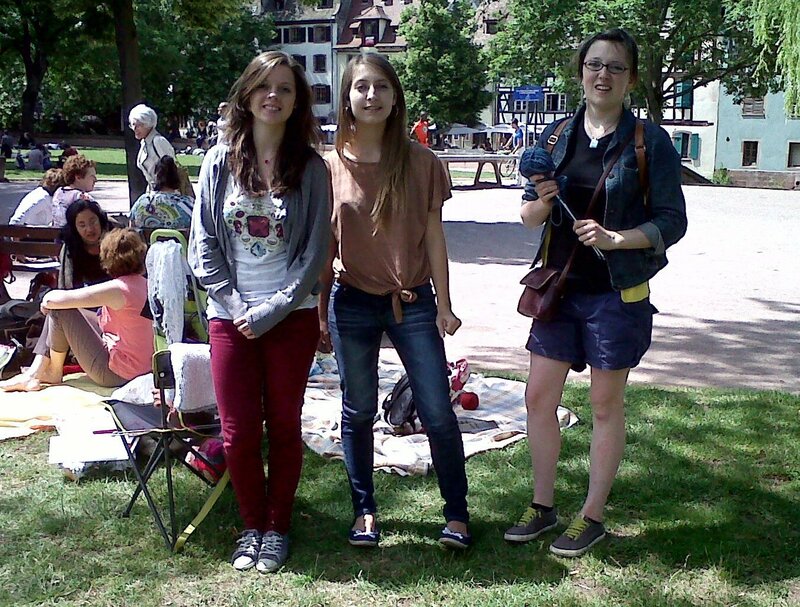 We were working up the courage to go over when a girl approached us and asked in English if we'd like to join. Somebody had heard my friend and I speaking English as they passed and the group got a girl who studies English to ask us to join. It was so nice how they went out of their way like that to include us. So we sat down and chatted for a few hours. It makes such a difference to have company while you knit. 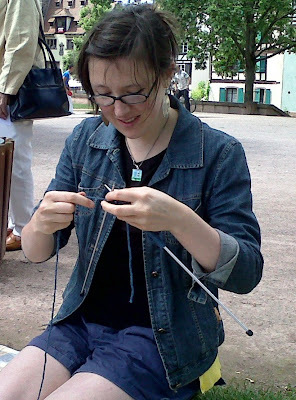 I don't have friends who knit so I usually do it on my own in front of a knitting podcast or an episode of White Collar. I maybe should have brought something simpler than my colourwork socks: I got distracted from the pattern a lot, and ended up making more mistakes while chatting than I ever did on my own! I was a great day out and the ladies from the Strasknitting group are so friendly! I'm disappointed I only joined them a few days before I leave for good, but I'm so glad I found out how nice it is to be part of a knitting group. 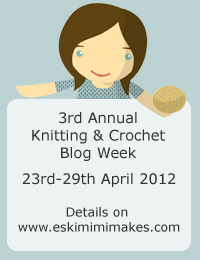 I'll be much less shy to join one in Dublin! As I said, I won't be able to join them at their next meeting as my time in Strasbourg is coming to an end. Today I will be packing, tonight my dad and brother arrive and tomorrow we'll set off through the Black Forest region (and Paris on the way home). 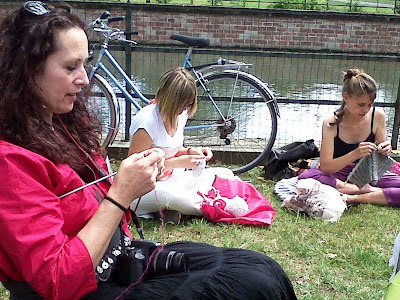 That looks like so much fun, its like a knitting picnic! 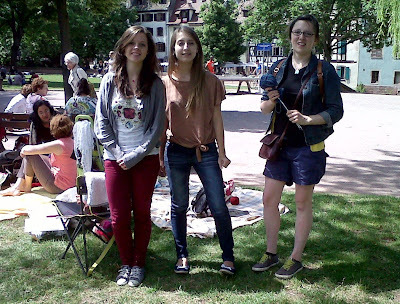 I'm moving to Strasbourg for erasmus after the summer and was googling knitting groups when I stumbled across your cute wee blog! 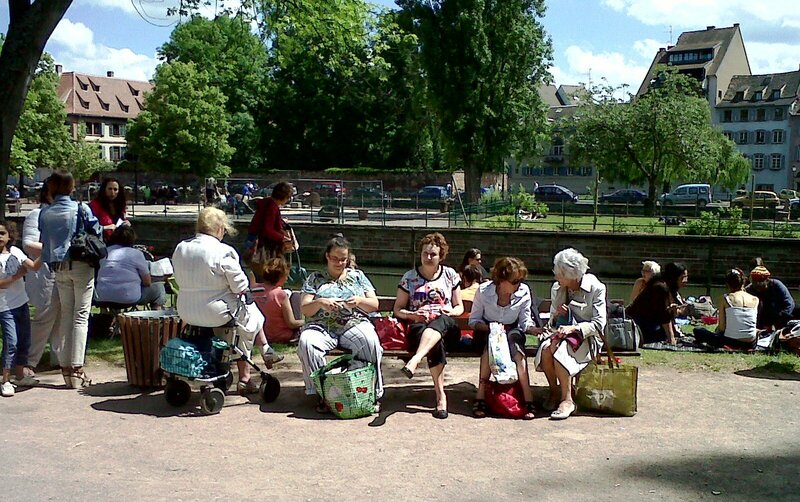 Any chance you could share how you found the Strasbourg group?